Yes, yes, yes... Just in time for the holidays, we have fun gift give-a-ways. For the next few weeks, we will be offering up special one of a kind and limited creations for the Venture fans. 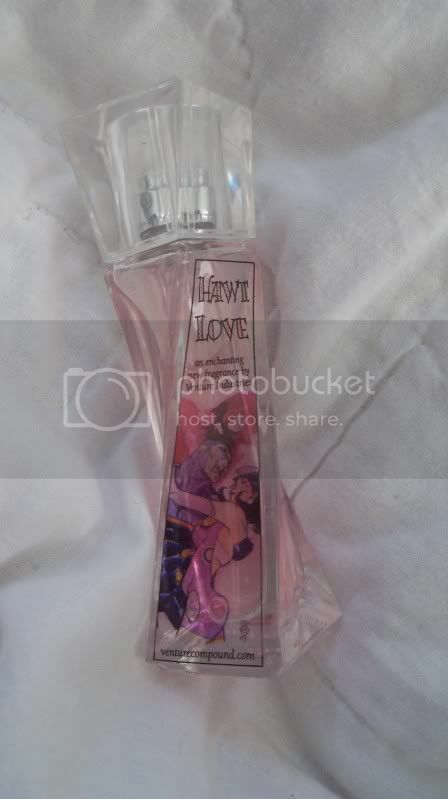 This week features a perfume we like to call "Hawt Love" based on the fragrance "Lovely" by Sarah J. Parker. Hawt Love celebrates the tryst between Dr. Girlfriend and Phantom Limb and all their hawt, smexy, steamy physical love. Not available in stores or for sale, Hawt Love is only available through this website and at limited give-a-ways at upcoming conventions like Stellar Con and Dragon*Con, to name a few. But by now you are wondering what you have to do to get it... it's easy, post a comment here. A winner will be randomly selected from the comment made and a winner will be picked. But wait! What was those promises you made about special deals for registered AstroCadets? Yes, that is right. For those of you who missed it, at Dragon*Con, we signed up people to be official AstroCadets. Those who gave us their name and e-mail received their AstroCadet ID card, a sticker and a tag flag to decorate their Dragon*Con badge. And they were promised special AstroCadet promotions. So here it is... when you post to enter the contest, include your official AstroCadet number on the ID card give to you. If you do, and you are chosen as a winner, you will get another extra prize along with the Hawt Love perfume. Simple! But wait again! That is not all. Venture Home News run by Tim Burgess on Facebook is also holding drawings and give-a-ways throughout the year. All you have to do is like them on Facebook and follow the news. This month they are giving away a Dr. Girlfriend action figure. Ok, I'll create a sample newsletter layout this week for you to peruse, with blank spots for you to fill in the sekrit Astrobase Cadet news. Stay tuned.